There is still a glitch with Roblox Studio where I can’t insert most of my own models so I have not had a chance to really try out this feature. From what I have been able to achieve, I like the idea, but I don’t think the implementation is practical enough. My initial perception of this feature was that it would be a way to retain the structure of a collection of objects. Example: If I made a package with a LocalScript in PlayerScripts, and a Sky in Lighting, when I insert it, I’d like it to keep that structure. Clearly not the case now, but maybe in the future? Please. Two things I absolutely despise about this feature! Moving or rotating a package counts as an update (same rotations and offsets), and a package with parts must have a PrimaryPart (why can’t the PackageLink do this if it’s required). Once (if) mass-updating is released, I’ll give the feature another try. But even with all the mentioned plans, I don’t feel like this is the best solution. If it’s specifically meant to update places, I’d rather have a web api, or allow universe scripts to update places. In the coming weeks we are making a minor change to the context menu. We are removing the [BETA] tag from all context menu options. We felt this added unnecessary text. Please keep in mind that the Packages feature is still in BETA. If the action is not usable it will no longer be seen in the Context Menu. – Example: If the Package is not a Script or contains no Scripts, the View Changes option will not be shown. We will begin talking about what’s next for Packages very soon! A less intrusive “unpublished packages” header, that does not disturb the 3D viewport. Ability to revert packages with changes to the latest published version. Are packages currently able to be used in free models? I read the documentation and there was no clear answer on whether or not I can share packages with other users yet. I think the BETA tag should only be removed if automatic updates and or mass-update is implemented first. Of course, if that’s in the change coming up, then by all means, go ahead. Could I get a screenshot sent to me for the first bullet? I want to make sure we are talking about the same thing. No, but this is a core tenant of what we want Packages to be. Soon as we get other functionality built and ready to go (e,g Mass Updates) we will begin looking into this for next steps. That winky face makes me very excited. I have an interesting use case that I have pondered and I think is not accounted for with the current Package design. First, I think Packages are a great resource for free model makers like me who creates high-quality scripts for free use. They promise to allow game developers using the scripts an easy way to update them to get the latest features and bug fixes. 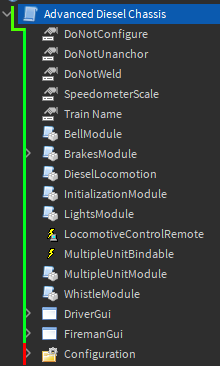 To that end, I’ve been thinking of using packages in a system that I call the “advanced chassis” which is a simulation of a diesel locomotive. Since the simulation is fairly thorough, it requires a lot of configurable options to function. Here comes the bind: if a player unlinks the Configuration from its package (as expected, as player must change the properties), the way I understand the package functionality is that the script package will see this as a change and prompt the player to update, removing the configurations entirely. Telling the user to register the Configuration as its own package is a possibility, but I prefer not to since I want to make the system as simple to use as possible. That’s my use case, hope it helps. Hey, I’ve been using this feature for a while now and it is really awesome. This is the current screen that prompts when you try to publish with packages that don’t have published changes. Please add the option to just publish the packages from the prompt, like so. Excuse me if I haven’t read the posts above. But I think that restricting to publish the game while a package is not published should be removed, the reason being that if a creator of a package is midway of a new version (and he/she needs to go) he has to unlink then relink the script, once the version is done, which is a hacky solution. Secondly, if someone is turning off their computer and forgot to publish, their game will not save changes which is a hassle. Is there any reason currently why it restricts publishing when the package is not published? I’d be willing to bet this restriction has to do with version control and how Roblox handles publishing vs version checking. I agree it’s a hassle and I usually avoid using packages for in-progress things, instead using them for modules in OOP style code and replacing assets in them only when a new final version is ready, otherwise pointing to an in-progress test asset outside the package. However this use seems in-line with their intended purpose. Will we be able to do live updates (the game automatically fetches a new version of a Package) for our games using Packages and Scripts? I believe that this feature is planned for future release. Do you mean it’s a built in feature or we’ll have to do it manually with a Script? Create symbolic link failed with error: The referenced version of the asset is not a package. This error message doesn’t actually tell you what package it is referring to… so if you have countless packages you have to manually go through each of them. I am having an issue where some of my packages cause studio to seize up, but when I remove the PackageLink then studio can process them properly. I am loading approximately 10 packages, and spamming ctrl+s when the studio file is loading sometimes lets me bypass this (lol) but otherwise studio just stops responding. When can we expect the mass-update feature to be released? Packages are very useful at the moment, but tedious to use because I have to open every single game and update them. Sometime within the next 2 months. So soon™.